Jupiter's ocean-harboring moon, Europa, as seen by NASA's Galileo spacecraft. The hunt for signs of alien life in the solar system may be much tougher than researchers had thought, thanks to the damaging effects of radiation. 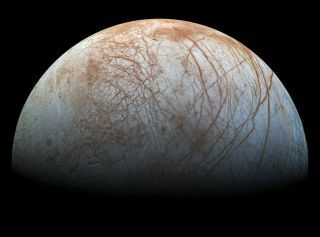 Two separate studies suggest that galactic radiation would quickly degrade biological material on the surface of Mars and Jupiter's ocean-harboring moon Europa, two of the prime targets in the search for past or present extraterrestrial life. Earth's thick atmosphere protects life here from the damaging effects of GCRs. But life on other worlds would not be so lucky; modern Mars has a thin atmosphere, for example, and Europa has virtually no atmosphere at all. Both worlds therefore are bombarded by high levels of radiation, which could spell doom for any fossils that may have once existed on the worlds' surfaces. Mars is the most Earth-like world in the solar system. Scientists think Mars once harbored a large ocean of liquid water that the planet lost, along with its atmosphere, billions of years ago. While scientists consider it unlikely that life exists at the Martian surface today, many researchers hope to find evidence that Martian life existed in the past. That evidence would come in the form of fossilized microorganisms or biological molecules such as amino acids, the building blocks of proteins. The search for life on Mars may be one of the biggest hunts in space exploration. See how the hunt for ancient evidence of Martian life may work in this infographic. Previous studies that dosed only amino acids found they could survive for up to 1 billion years under Martian conditions. However, Pavlov's team mixed the amino acids with rocky material similar to that found on Mars, generating conditions a rover is more likely to sample. The researchers found that the amino acids were degraded by radiation in as few as 50 million years. The scientists then combined the surface sample with water to simulate historically wet regions on Mars; these are the places considered most favorable to life. Water accelerated the degradation of the biomarkers, destroying some in as few as 500,000 years and all within 10 million years. The odds of finding signs of life in hydrated minerals near the Martian surface therefore aren't great, the researchers said. Cold temperatures slow the degradation process down, but not enough for long-term preservation, the scientists said. Material lasted no more than 100 million years when exposed to Mars-like GRC levels. These findings could be bad news for missions that plan to search for signs of ancient life on the Martian surface, the researchers said. "We are extremely unlikely to find primitive amino acid molecules in the top 1 meter [3.3 feet] [of the crust], due to cosmic rays," Pavlov said. "It would be critical to provide missions with 2-meter [6.6 m] drilling capabilities, or chose landing sights with freshly exposed rocks." Such rocks would have been kicked up from beneath the surface by asteroid or comet impacts within the last 10 million years, he said. In 2020, the European Space Agency and Russia plan to launch a life-hunting Mars rover that can drill up to 2 meters down. The mission will be the second phase of the ExoMars mission; the first phase, which consists of an orbiter and a landing demonstrator, launched in March. The ExoMars rover should be able to reach sites at which radiation damage is mitigated but not completely absent, Pavlov said. Too hot on an icy moon? Jupiter's moon Europa is considered one of the best places to search for life beyond Earth. A global ocean sloshes beneath the moon's icy shell, fed by thermal vents that could possibly generate the energy needed for life to evolve. NASA aims to launch a flyby mission to Europa in the 2020s, and the agency is considering adding a lander to the mission profile as well. Europa's ice shell is thought to be miles thick on average, so a lander wouldn't be able to drill through the ice (except perhaps in a few select spots). But signs of Europan life, if it exists, may rise up from the ocean onto the surface. Indeed, Europa has reddish surface features that have been identified as salts, which likely came from beneath. Scientists have also tentatively identified, but not confirmed, plumes like those found on Saturn's moon Enceladus, which could shoot water-rich material — and, possibly, signs of life — from the ocean to the surface. Like Pavlov, Luis Teodoro, a planetary scientist at NASA's Ames Research Center in California, was concerned with GCR radiation, and how dosages could affect the hunt for life. But Teodoro focused on Europa, not Mars. Simulating the conditions at Europa, Teodoro found that the moon's GCR dosages were comparable to those on the Red Planet. "Radiation is going to play a major role at Europa in the top few meters — actually, dare I say, dozen meters — of Europa's surface," Teodoro said at the same conference. He said his simulations suggest that hardy "extremophile" microbes found in some of Earth's harshest environments would survive no more than 150,000 years in the top 3.3 feet (1 m) of Europa's icy crust. Organic biomarkers buried within 3.3 feet of the surface would last only 1 to 2 million years, he said. "If we want to put a landeron the surface of Europa to check if life is there, we most likely are going to see something destroyed — mangled materials, mainly organics — from this huge dosage of radiation," he said. There is hope, however, that fresh surface ice deposits could still contain biomarkers that scientists could successfully identify as life. So it's important to determine if Europa does indeed spout plumes that bring fresh material to the surface, Teodoro said. Europa also is exposed to another source of radiation that Earth and Mars avoid: the radiation from Jupiter. Teodoro said he plans to include the effects of Jupiter's doses in future models. For now, however, his research seems to suggest that hunting for existing life or fossils on the icy moon may remain a challenge. But Teodoro said he hasn't given up completely on the cool world. "Maybe this is all telling us life is not at the surface," he said, expressing his hope that evidence of alien organisms instead lies beneath the ice.